Anti-TB drug research and development is focusing increasingly on testing TB drug regimens rather than on individual drugs. 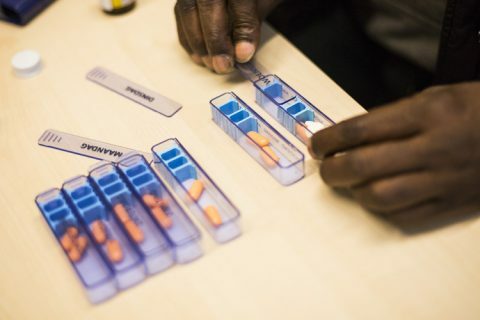 The development of Target Regimen Profiles (TRPs) will give guidance to the developers of TB drug regimens and help align the regimens with patients’ and programmatic needs at country level. This approach is expected to lead to the introduction of shorter, less toxic, and operationally feasible treatment regimens. KNCV welcomes this, having been closely involved in the consensus process and engaged in preparing a road map for implementation. In July 2016, KNCV’s Technical Director Michael Kimerling participated in the consensus meeting in Geneva that outlined the strategic thinking on the future treatment of TB. The outcome of this meeting is summarized in the Report ‘Consensus meeting for finalization of Target Regimen Profiles for TB treatment‘. KNCV has been involved in this consultation process for several years, initially with the participation of Professor Frank Cobelens, at the time Scientific Director of KNCV, and more recently Dr. Michael Kimerling, who focuses on the country adoption and policy-making perspective. KNCV is not itself involved in the testing of the drug regimens directly – these are being tested primarily through the TB Alliance and other clinical trials consortia. Instead, KNCV represents the view from the field and the perspective of implementers in terms of what treatment strategies are needed and how best to justify, introduce and adopt these regimens to achieve the best success in implementation.